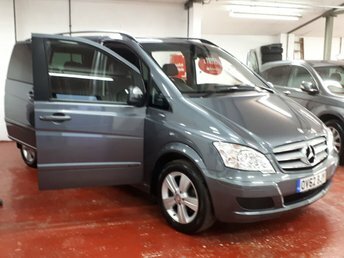 This sleek MPV from Mercedes ticks plenty of boxes if you're looking for a reliable and stylish way to move large numbers of people easily and in comfort. The Viano's flexible interior is easy to access thanks to sliding doors, while the model offers a smooth and refined ride. For great deals on used Mercedes-Benz Viano MPVs in Melksham, make sure you speak to a member of the team at GRS Cars. We're always available to discuss your requirements and will go the extra mile to ensure you find an MPV to suit your family's or your business' needs. Remember to view our latest stock here on the website.